The poor have religion, the rich have spirituality and enthusiasts have photography to get them through life's bumps and bruises. We fall into the third category, so when the approach of winter started sinking our spirits, we grabbed a camera. Along the side of the bunker, we had noticed a calla lily blooming in December. It isn't spring in this hemisphere, but we've had warmer weather than we see in the summer and apparently calla lilies aren't patient. They're associated with "holiness, faith and purity," according to the Teleflora blog, which makes them particularly off key these days. But there's not denying their beauty. 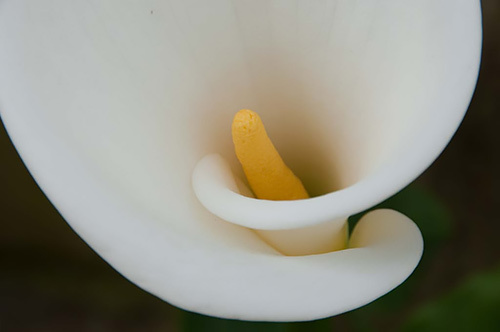 In fact, the Greek word for beautiful is, apparently, calla. We'd been reminding ourselves to photograph the thing before it fades. And just as we were about to inflict another reminder on ourselves, we decided instead to just do it. Can't tell you how often we resort to Dehaze with perfectly clear photos. So we did. It was cramped and shady and we had a hard time lining up the shot. The zoom kept creeping toward telephoto as we aimed downward. Our settings were all wrong. And the wind came up. But we shot Raw and were saved. We've noticed ourselves getting into a Raw post processing rut so we thought we'd challenge ourselves to do things a little differently. We certainly had a different subject. Black and white, first of all. It's formal in the way writing a sonnet is -- or in our case a limerick. Just the tones, no color. The crop was a real question. We decided we wanted the flower to float over the darkness. We liked the repeating curvature at the bottom of the white flower and didn't want to interrupt it. Then there was the darks. How dark exactly? Real dark. But not black. We liked the almost ghost-like image of the green leaves below the flower. It was, in black and white, like an echo of the flower. We knew we wanted detail in the highlights. When we saw those pinstripes (after a bit of Dehaze), we were happy. We had already stretched the histogram out all the way to black and all the way to white. Original Image. The JPEG thumbnail from the Raw file. The spadix (we did some research) of a calla lily is, uh, golden. So adjusting the Yellow slider was not enough. We had to adjust the Orange slider as well to get the contrast and tonality we wanted. The only other hue we adjusted was Green to bring out the ghostly leaves. It was a different approach than we usually take and we enjoyed exercising different photographic muscles. Hope you like the results. But if not, keep your comments holy, faithful and pure, considering the subject.